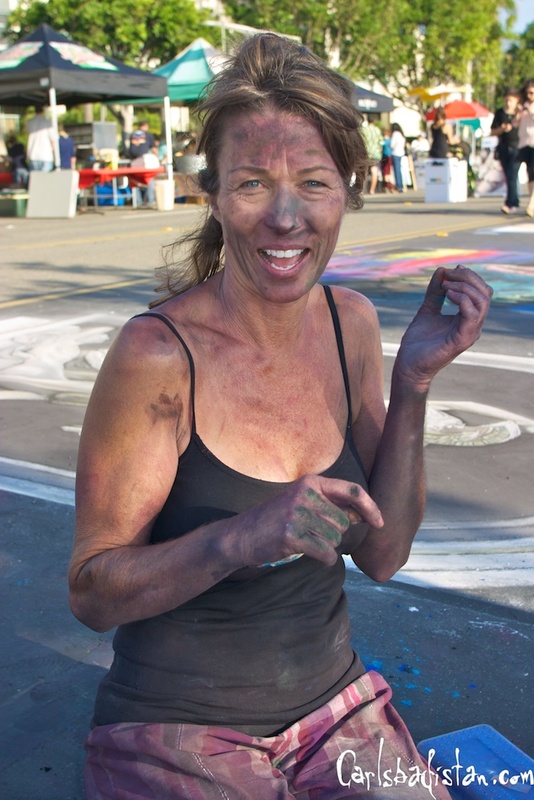 The chalk artists, on the other hand, didn’t seem to mind having their art photographed. After all, photos are the only thing that’s left after the street sweepers come rolling through. But that kind of goes with the transience of the form. And that’s good, because without the help of artists like Kostylo Art Splash would never even happen. And without it, local schools would not get a little extra money for their art and music programs. Click here for a photo gallery from Art Splash 2011. Carlsbadistan’s Armada Drive will get its annual chalk art dressing today (September 24, 2011) as Carlsbad Art Splash takes over the street with art, food, and fun for the entire family. And by the looks of the weather today the word “splash” seems quite appropriate. 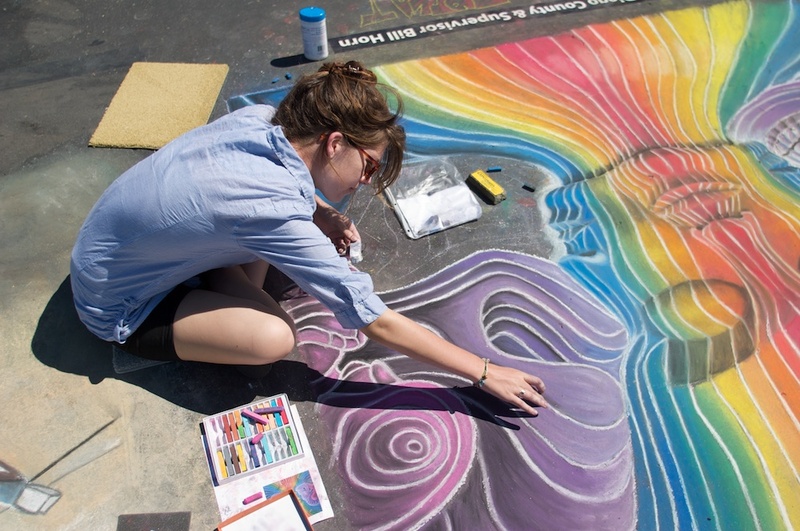 Art Splash featured professional chalk art, fine art venders, hands-on art projects, Music, children’s activities and sand sculpture. 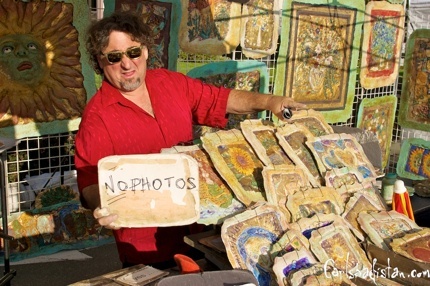 The community celebration for arts education begins at 10 AM and continues through 5 PM Sunday, September 25, 2011. Click here for a photo gallery from last year, or here for past Carlsbadistan.com coverage of the event. 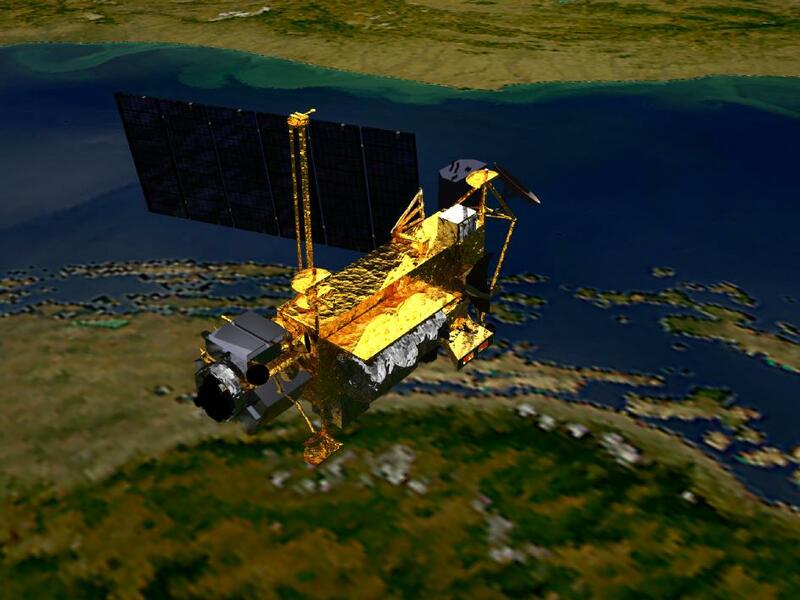 The 35-foot-long, 15-foot-diameter “decommissioned” NASA Upper Atmosphere Research Satellite (UARS) will quite likely fall from the sky tonight between 8 PM and midnight tonight PDT. The good news for us is that during that time it will not be passing over the continental United States, and more importantly, not over Carlsbadistan according to NASA. As of 7 p.m. EDT on Sept. 23, 2011, the orbit of UARS was 90 miles by 95 miles (145 km by 150 km). Re-entry is expected between 11 p.m. Friday, Sept. 23, and 3 a.m., Sept. 24, Eastern Daylight Time (3 a.m. to 7 a.m. GMT). During that time period, the satellite will be passing over Canada, Africa and Australia, as well as vast areas of the Pacific, Atlantic and Indian oceans. The risk to public safety is very remote. The bad news is only for Canada, Africa, and Australia, apparently. If Carlsbadistan wasn’t buried in a continual layer of fog it would be possible to see (and maybe hear) the speeding ball of fire tonight around 7:45 PM, according to NBC San Diego. For more updated info, click the link. Those into blues harmonica (and really, what other kind is there?) 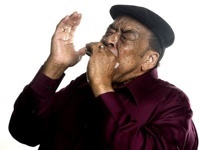 will want to hit up Carlsbadistan’s Museum of Making Music on Sunday, September 18, 2011 as Grammy Award-winning player James “Mr. Superharp” Cotton plays at 6:45 PM. — To prevent carbon monoxide poisoning, use generators, pressure washers, grills, and similar items outdoors only. — If the power is out longer than two hours, throw away food that has a temperature higher than 40°F. — Check with local authorities to be sure your water is safe. — In hot weather, stay cool and drink plenty of fluids to prevent heat-related illness. — Wear layers of clothing, which help to keep in body heat. — Avoid power lines and use electric tools and appliances safely to prevent electrical shock. For more detailed information, please click the link. 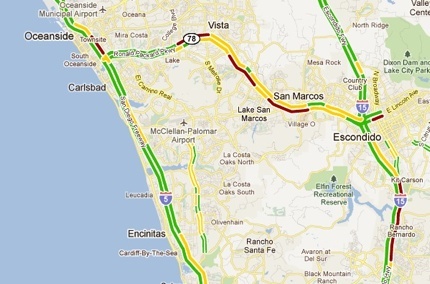 While it took some commuters nearly an hour to get from San Marcos to Carlsbad on Palomar Airport Rd, by 6:35 PM Interstate 5 and Highway 78 were moving. There was some slowing on Northbound 5 at Palomar Airport Rd. (and North of the 78) and Westbound 78 near Emerald Drive. For more live Google traffic maps, click here. Parts of Carlsbadistan began losing power today (Thursday, September 8, 2011) at around 4 PM. And soon, the power was out all over San Diego County as well as in part of Orange County and Mexico. 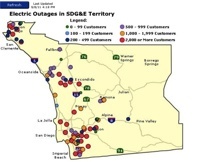 SDG&E’s outage report page showed the above image at 4:18 PM, but by 4:45 PM the page was no longer accessible. We’re not sure exactly why. 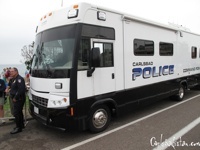 For the latest update, please follow us on twitter at http://www.twitter.com/carlsbadistan. Tweet us when power comes back on in your neighborhood. Update: 5:31 PM: @SDGE We do not have an estimated restoration time. The power could be out through the night and into tomorrow. Update: 5:41 PM: @CarlsbadParkRec City libraries closing at 6 p.m. Residents should stay home if possible. Swimmer Injures Neck At Walnut St.
Carlsbad State Beach Lifeguards, Park Rangers, and the Carlsbad Fire Department responded yesterday (September3, 2011) just before 5 PM to an injured swimmer near Walnut St. According to witnesses, the middle aged man injured his neck and was transported via ambulance to a local hospital. The Carlsbad Police Department will be hosting a DUI checkpoint today in Carlsbadistan at Palomar Airport Rd and Innovation Way (Bressi Ranchers beware!) giving you all kinds of reason to avoid this stretch of road today. While they’d probably catch a lot more people driving under the influence on Sunday night, September 4, 2011, is nice of the department to host this DUI checkpoint on Friday before everyone really even gets started drinking. It also means more officers can get their work done and still get to their own responsible Labor Day partying the rest of the weekend. 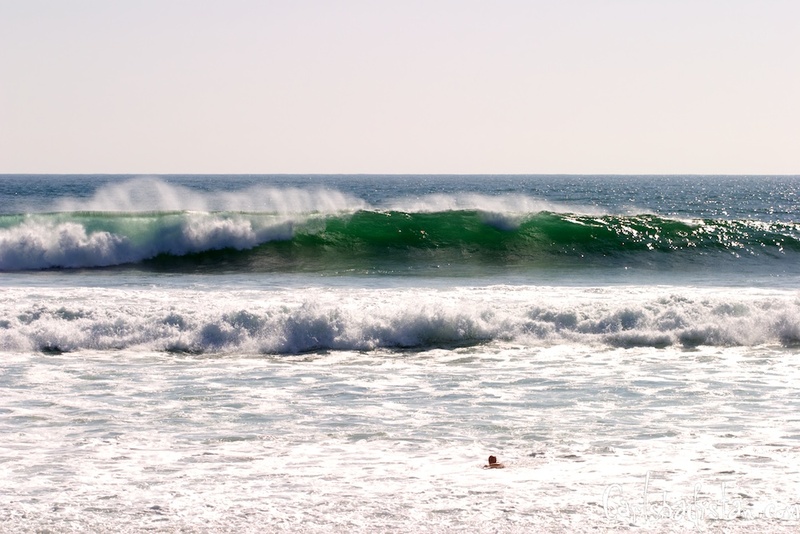 There were some huge waves rolling through Carlsbadistan earlier today. Some of them got ridden, however, most (like this one) plowed right through untouched. Today there were more spectators than there were surfers. 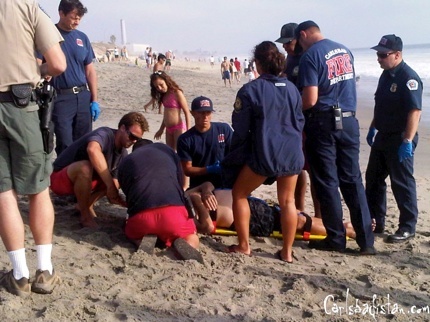 And we’re pretty sure the State Beach Life Guards were happy about that.